Like all bullies, my guys are complete clowns and thrive off of being the center of attention. They don't mind being dressed up, as long as someone makes a fuss over them. My boys are true breed ambassadors. They have been performed many demos, at dog training and breed events; and have manned the kiss-a-pit booth at plenty of events. They all have their AKC Canine Good Citizen Award, passed their ATTS Temperament Test Certification, and are certified Therapy Dogs. They are also a couple of the top titled American Pit Bull Terriers in the country, holding multiple titles; as well as, some national rankings in conformation, agility, obedience, rally, weight pull, and flyball. Comments for My Pittieful Crew. What a wonderful group of pitties! They look adore-a-bull, although not so amused. They definitely get my vote. Good Luck! i missed the deadline to enter my babies...so yours have my vote!! this is too cute!! love it!! So cool I especially love little piglet. Thats really cute costumes! Thanks for being an example of what pit owner can and should be. Congrats on all your accomplisments with these wonderful dogs. That is just about the cutest thing ever!!! 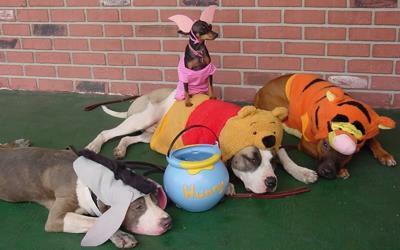 Omgoodness, I am still laughing at how bored they look...and the little guy as Piglet...this is so adorable and all the dogs are beautiful! Remy saw his dad and ran away. I love how your crew let's you do that. Piglet is just too adorable for words. They are so adora-bull. 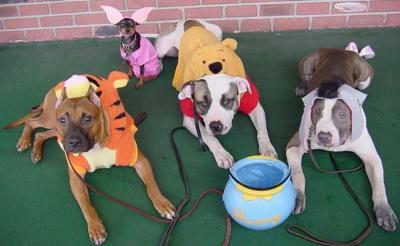 That is the cutest group of costumes ever. It is amazing how they just take it all in stride, such wonderful temperaments. I also love how Piglet is sitting on the big guy. They're just so well behaved and darn cute. Mine won't sit still! Your dogs are beautiful!! And also the best they can be! I have 3 pibbles myself, and I wouldn't trade them for anything!They are my best buddys, and soo funny! Good Luck in contest! 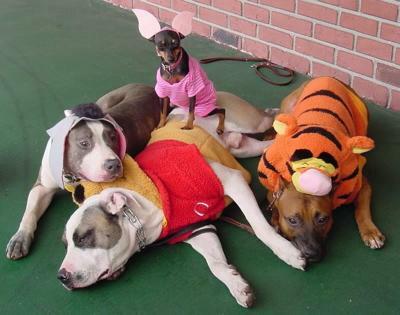 I'm over here, looking at the pics and lmbo..you did NOT put those HUGE ears on the little guy...LOL..this is just too cute..All of your dogs look graat..And thank you for promoting the Pitties in a very positive way..
Smoochies to the Poo team..